The First Thanksgiving 1621 by Jean Leon Gerome Ferris (1899). Giving thanks for a bountiful harvest is commonplace in almost all religions and societies; it is quite ancient in origin. The Egyptians, Greeks and Romans feasted and paid homage to their gods after a successful harvest. Thanksgiving is also very similar to the ancient Jewish harvest festival of Sukkot. 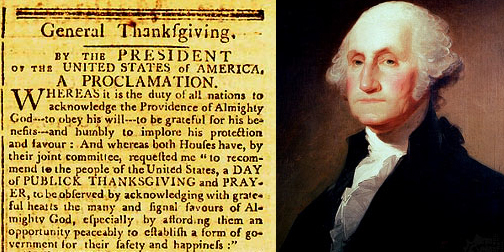 In North America the history of Thanksgiving Day can be traced back to England and the Protestant Reformation. 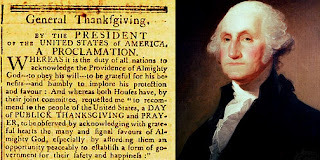 In the United States, Thanksgiving is a national holiday which is celebrated on the fourth Thursday of November even though it is well past the actual harvest itself. Thanksgiving is also a statutory holiday in most jurisdictions of Canada and celebrated on the second Monday of October. In 1620 after a rigorous 66 day voyage a small ship called the Mayflower dropped anchor near the tip of present day Cape Cod and it’s passengers were ready to embark on new lives. The English men, women and children aboard this vessel were a group of Puritans and separatists who were seeking a new home where they could practice their faith freely and others were lured by the promise of land ownership and new found wealth. After crossing the Massachusetts Bay the Pilgrims began to establish a new colony at Plymouth. During the first brutal winter many of the colonists remained on board the ship where they suffered from exposure, scurvy and other contagious diseases. Only half of the original 102 passengers survived to see the spring. When they finally moved ashore they were surprised when they met an Abenaki Indian who greeted them in English. They were soon introduced to other tribes including the Patuxet and the Wampanoag. The Pilgrims along side their Indian teachers, were taught how to cultivate corn, extract maple sap, catch fish and also how to avoid poisonous plants. In 1621 after the first successful corn harvest the Governor at the time, William Bradford, called for a celebratory feast and invited the colonists and their local Native American allies. This first autumn harvest celebration lasted three days. There is no historical record of the exact fare served at this first Thanksgiving celebration. Edward Winslow who chronicled the event noted that Governor William Bradford sent four men on a “fowling” mission in preparation for the feast. Wild turkey would have been likely plentiful in the region and was a common food source for the settlers and the Native Americans. It is also possible that the hunting party returned with other birds such as ducks, geese and swan. In lieu of a bread based stuffing, the birds may have been dressed with herbs, onions and nuts for extra flavor. Below is an interesting quote from www.history.com explaining why people feel so sleepy after a big Thanksgiving meal. Surprisingly it is not just the fault of that big ole Turkey! Many people report feeling drowsy after eating a Thanksgiving meal. Turkey often gets blamed because it contains tryptophan, an amino acid that can have a somnolent effect. But studies suggest it’s the carbohydrate-rich sides and desserts that allow tryptophan to enter the brain. In other words, eating turkey without the trimmings could prevent that post-Thanksgiving energy lull. The pilgrims who attended the first Thanksgiving feast probably got their fair share of meat as well. Winslow reported that the Wampanoag tribe arrived with their offerings which included five deer. Historians theorize that the deer was likely roasted on a spit over a fire and that the venison might have been used to cook up a stew. Culinary historians also believe that this first meal would have consisted of seafood which is not often found on today’s menu. Abundant in New England were mussels and they were often served with curds (a dairy product similar to cottage cheese). Bass, lobster and clams might have been on the table as well. Local vegetables that may have adorned the table would include onions, beans, lettuce, spinach, cabbage, carrots and perhaps peas. Corn was plentiful as well. Corn would not have been eaten on the cob but removed and turned into cornmeal. The cornmeal would be cooked into a porridge that was occasionally sweetened with molasses. Potatoes (mashed or roasted) were certainly not on the first Thanksgiving table. The potato was introduced to Europe by the Spaniards who brought them over from South America in 1570. It had not made it’s way back over to North America at the date of the first Thanksgiving feast! The native inhabitants were known to eat other plant roots like Indian turnips and groundnuts which may or may not have been served. Fruits might have included blueberries, plums, grapes, gooseberries, raspberries and as we know cranberries! The cranberries would not have been made into sauces or relishes as the Pilgrims had depleted their supply of sugar. This culinary tradition happened about 50 years later! The settlers and the Wampanoag tribe did eat pumpkin and squashes that were indigenous to the area but the colony lacked the butter and wheat flour to make a proper pie crust. The pilgrims improvised by hollowing out a pumpkin and filling it with milk, honey and spices to make a custard and then roasting the pumpkin in hot ashes. For a short course on 8 of your favorite Thanksgiving foods, check out this article from The Washington Post. Thanks for all your submissions! For more recipe ideas check out this great article from the New York Times which highlights Thanksgiving recipes state by state. Also, for a comprehensive guide and "how to" make your favorites dishes check out this tutorial, also from the New York Times.